How do they do it? How does a slightly above average football program (note: in relation to their conference, which is well below average) that is so known for its epic face plants that “pulling a Clemson” has become part of our lexicon, continue to get commitments from top notch high school football players? The article I linked about Pagano’s commitment really doesn’t clear things up at all. As a matter of fact, it makes things murkier than ever. It’s a bizarre interview that would fit just as well on the pages of The Onion as it does on Korny and Kmac’s Sportstalk page. Let’s review some of Pagano’s comments, shall we? Look, upstate South Carolina is no trash dump. It’s quite lovely in areas as a matter of fact. BUT THIS DUDE IS FROM HAWAII. WHAT…THE…F?!? Are you serious? Was he hanging out with Sammy in the Cadillac before this visit? The guy from Hawaii just called Clemson “perfect”. In any context that is just wrong, and should raise suspicions of drug use and/or large bills stuffed in plain paper bags. OK, fair point. One for the kid. Not sure why these two are intertwined, but the “religion” point is a common theme you hear out of recruits who visit CTU. 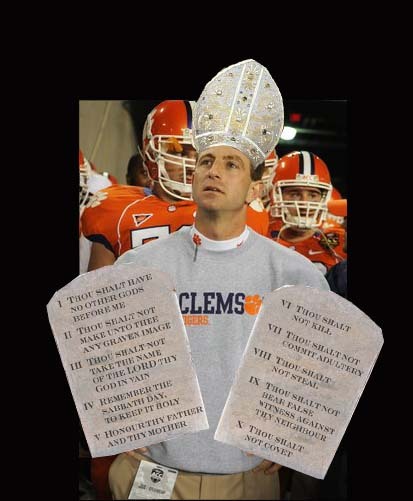 That Dabo must be a real saint. As far as believing in team unity, this is undoubtedly in stark contrast to the other coaches at schools he visited that are hell bent on team division. This must really set CTU apart. Again, he’s from HAWAII. Let’s see, Hawaii, Lake Hartwell, Hawaii, Lake Hartwell, Hawaii, Lake Hartwell…I’ll take Lake Hartwell because I’m DUMB AS A BAG OF BALL PEEN HAMMERS. Wha…I…what? Top 10 in…the ACC? The state of South Carolina? Are the Clemson folks just flat out lying to recruits? Ah, geez, it’s brainwashing. No question about it. They’ve got some Tony Robbins-type dude who instead of convincing them to walk on hot coals convinces them to commit to CTU. Or maybe, just maybe, there is a large armoire somewhere on campus that takes you to Narnia. Hmmm… Lake Hartwell over Hawaii- They must have red mud there too. Top 10 academically- Top 10 was a 10 year goal not reached; made it to Top 25 based on US News and World Report Rankings. Most truth ever: “He’s like my high school caoch”. Bottom line: they slipped the boy the orange kool-aid quick. This is hilarious and great, as usual.